Buy and organize all your music easily. Is there a better alternative to Beatport Pro? Is Beatport Pro really the best app in Music category? Will Beatport Pro work good on macOS 10.13.4? 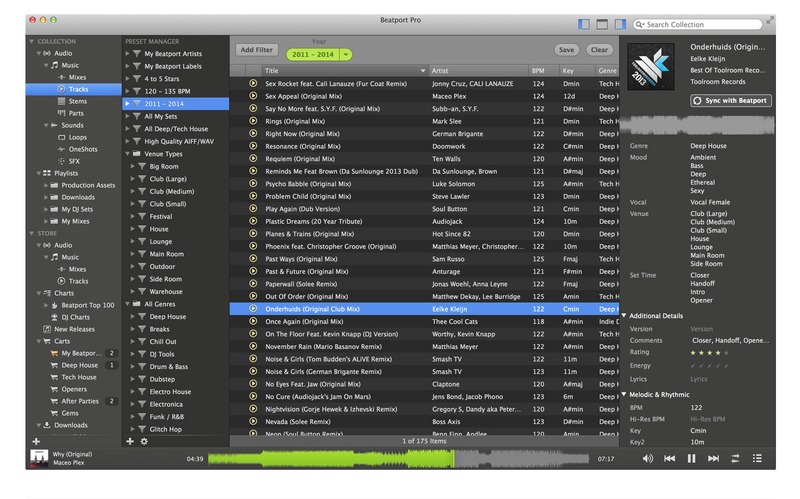 Beatport Pro lets you buy and organize all your music in one place. Experience complete flexibility and creative freedom with the all-new Beatport Pro - built by DJs for DJs. Manage Your Music Collection - Import and organize your music collection. Create and manage playlists. Add extended metadata to your entire collection, and use advanced filtering to view your music collection in new ways. Organize your audio by tracks, mixes, stems, parts, loops, oneshots, and sound effects. Beatport Pro needs a rating. Be the first to rate this app and get the discussion started! Find the Tracks You Love - With advanced filtering tools, the new Beatport Pro simplifies the experience of discovering new music on the Beatport store and in your collection while digging for that perfect track. Transform Your Library With Tags - Tag your music collection with attributes such as "venue," "mood," "instruments," and "processing." No more hacking your comments or genre tags. Sync your entire music collection with the extensive Beatport catalog to make sure your metadata is complete. Transform your music collection in ways you never imagined possible. Shop With Multiple Carts - Use multiple carts as a flexible categorization system while you shop. Separate your carts by genre or energy, or create carts for each gig that you’ve got coming up. The possibilities are truly endless. Experience Perfect Integration - Your audio library can be shared between other popular applications and Beatport Pro. Want the power of Beatport Pro, but still be able to access your files in iTunes, Traktor, or Rekordbox the way you always have? We’ve got you covered. Send Music to Your iOS Devices - Experience the freedom of moving music to your devices. Now you can push playlists and music to your iOS devices via iTunes from within Beatport Pro.